At 3DR our mission as a company is to enable everyone to “see their world from above.” For the average person, it’s a new and enlightening perspective to simply see their neighborhood from above for the first time. Solo is a massively complex system capable of complete autonomous flight that would have cost tens of thousands of dollars and require expert training only a few years ago. Yet Solo is simple enough to fly with little to no training. 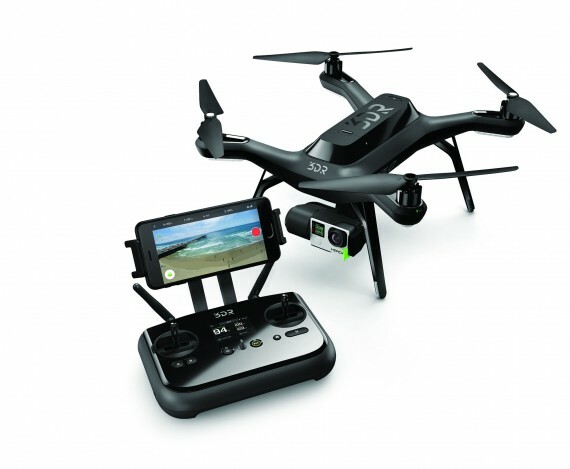 Solo began with the insight that users want to shoot great aerial video but it is out of reach for anyone but highly skilled pilots. In the last five years there has been a rise of ‘cinema drones’ used in Hollywood films. These drones are controlled by 2-person crews, one to fly the drone and one to control the camera. We knew if we could leverage our expertise in autonomous flight, we could allow mere mortals to do the same task alone. Hence the name Solo. To design Solo, we interviewed multiple pro videographers to learn their techniques and specific camera moves. We built an open source, scriptable companion computer to control Solo’s autopilot to build what we call Smart Shots – complex camera moves distilled into simple tools. These shots are written in an common, accessible language called Python and they allow the designer to control all aspects of the behavior of the drone. Every day we flew with real people to test and refine our interaction concepts and improve smart shots. To make new pilots comfortable, we designed the Solo controller to feel as familiar as a video game controller. The controller’s small color LCD displays telemetry and alerts, leaving the users mobile device focused on the streaming HD video.This helped us streamline the mobile app and give users a more consistent experience. We choose Wifi and IP networking for our controller to allow users to connect their drone to leverage the creative power of the internet and cloud services such as FAA warnings and alerts. During development we quickly realized photographers weren’t the only potential users. The people we interviewed overwhelmingly wanted to use Solo for work to do tasks such as surveys, inspections, documentation, search and rescue. Even conservationists are using it to gather scientific data and monitoring endangered animals. Solo is quickly becoming a tool for others to build upon. We chose Empowering not just because Solo allows new pilots to capture beautiful cinematic shots that would otherwise require years of practice. But because Solo is a platform that allows anyone to leverage the power of autonomous robotics to solve real world problems.